My wife is up for an IR-1 visa. I always thought that "rescheduling the interview" would be simple, since the embassy has lots of links to the website for doing this. However, I never clicked on those links since we had no interview to reschedule. We just got notice of my wife's embassy interview date -- in Manila, April 5. She's in Philippines, I'm in the US and won't return there until after April 5. We plan to go to the interview together -- and I have the critical paperwork, anyway. We want to reschedule for a later date. I've been to all the "reschedule" links. None of them work. (The traveldocs site gives a "404 Page Not Found" error; the cgifederal site shows a blank calendar with no slots -- to 2022 and beyond; the embassy's own FAQ hints at rescheduling but gives no instructions or links.) There are links for scheduling a NONimmigrant visa interview, but empty links for scheduling an immigrant visa interview. My wife called some of the numbers we've found. She talked to the Visa Services Center, but they see the same calendar I see -- no slots open for years (can't be true, but they couldn't give any information on when slots will show up). I called the Center from the US, with the same results. They can't reschedule since they don't see any empty slots, and they can't tell us when to expect them. We want to cancel the April 5 interview. How do we do that? 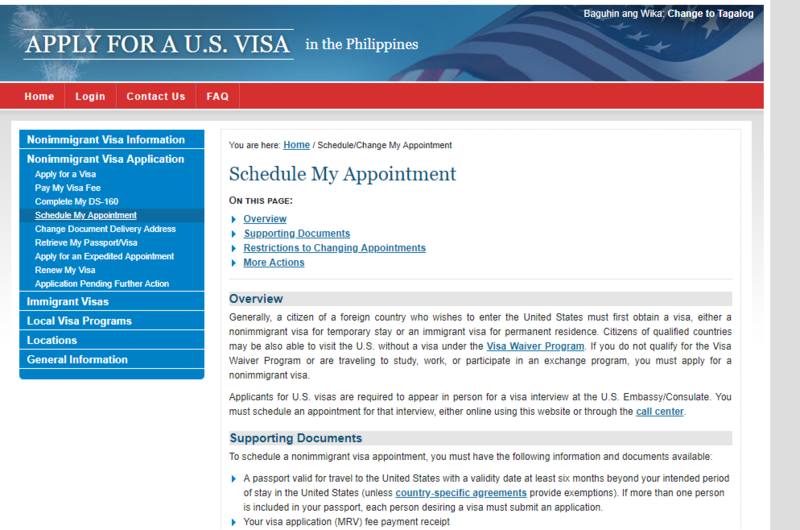 How to contact the embassy directly for interview scheduling or canceling? Can we just not show up, and not be penalized for that? Then, how do we reschedule for a later date? Does their calendar get populated every now and then with open slots? The Visa Service Center doesn't have clear answers. My mother-in-law has the following. First your case file MUST be at the embassy before you can do this. It is very possible that April is filling up already. If you case file is already at USEM, you could schedule an earlier (or later) interview appointment. 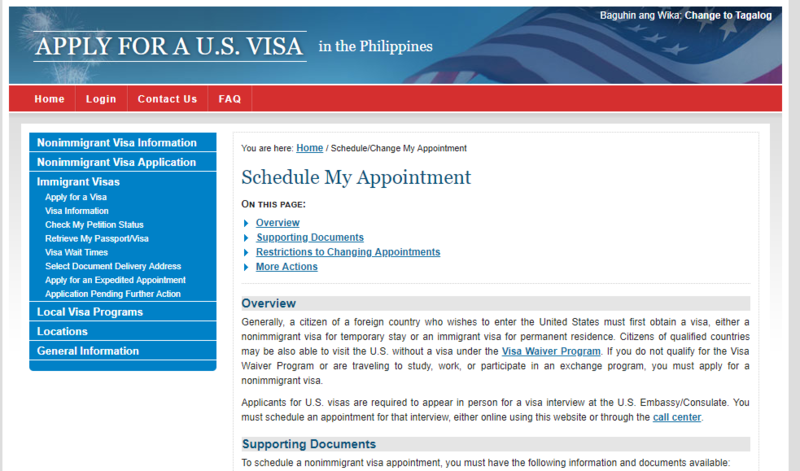 "Immigrant Visa applicants who already have an interview appointment scheduled by the National Visa Center (NVC) should refrain from scheduling an earlier appointment through the Visa Information and Appointment Service Center without first checking to make sure Embassy Manila has the physical case file. While we are happy to accommodate earlier appointments, we are only able to do so when we have already received the physical case file from the NVC. When the physical case file is either still with the NVC or in transit to Embassy Manila, we are unable to grant earlier appointment dates. This is because we need the physical case file to conduct an effective visa interview." By Calling (632) 976-8500, (632) 976-8501 or (632) 976-8502. OP here.... samuelam and Hank -- thanks for the replies. Hank, how do I determine if the embassy has her file? I've read those instructions before, but they only hint at calling the Visa Service Center. My wife and I both called those numbers, they took information and didn't say anything about "file not arrived". They said the calendar they see (the same one I saw) doesn't have any open slots for months and months (hard to believe, I suspect the embassy just hasn't filled them in yet). In the meantime, as time is getting short, I'll try to cancel the April 5 interview through the Visa Service Center. If we can't, what happens if she doesn't show up for the interview on that date? If you created an online profile here > http://www.ustraveldocs.com/ph/ , you might (very possible even) not see the available dates until you cancel your current interview date. Make sure your case file is at the embassy, you will know this by seeing READY status on CEAC. You should be able simple call the appt center and cancel your current interview date. Just a curious question. Are you cancelling the appt simply so you can be there? USEM is not a difficult embassy if you have your ducks in a row. Hank -- Thanks for the CEAC link. It shows READY. I thought I knew all the steps to go through, but I didn't know about CEACStatTracker. So they have the package at the embassy. I'll call the Visa Service Center again and try to cancel the April 5 interview, and see what happens from there. I really didn't expect NVC to finish and get the interview date this fast. No problem, I thought it would be easy to reschedule if necessary. We've planned all along that we would both go in for the interview. We have everything in order -- but I have the critical paperwork (originals) that I'll be bringing back to Philippines in a month. We live on Leyte, we have a one-year-old, my wife can't make that trip to Manila alone anyway. So April 5th won't work. None of this would be a problem, as long as we can reschedule. So I'll work with the Visa Service Center -- hopefully I'll see available slots on their calendar. Embassy updated their website a last year and a bunch of stuff was missing or links were totally useless, I had an email exchange going on between myself and them for awhile trying to get the checklist corrected .. which is silly that no one there confirmed the new website information was accurate. Even now there are useless links but I haven't bother to contact them as of yet. http://www.ustraveldocs.com/ph/ph-iv-visaapplyinfo.asp << IV link. It appears you wil have to call to cancel and reschedule. I'll get it done by phone. The reps on the Visa Service Center line are pleasant and helpful, although they make it clear that they have no more prior information on calendar slots than I do ("none") -- it's up to the embassy.